Quote Reply Topic: WHYDAH shipwreck coin for sale. 1717 Authentic Whydah pirate shipwreck coin for sale. Certificate of Authenticity. $1500. You will not find this anywhere else. Please e-mail me at birds-or-shells@comcast.net to discuss this coin. Thanks! This coin was sold on eBay (not to me). If anyone has a Whydah coin or artifact to sell, please contact me at birdsorshells@verizon.net Thanks! I do have a coin from the Whydah, and it is currently being verified / appraised. It's dated 1699, gold & silver combined, and personally found on the cape in the area of the wreck. Any ideas what it is worth, before the appraisal comes back?? I have tried uploading here, but size is too large. Hello, Whydah coins on the market are very scarce. The only ones available are gifts that were given to investors of the Whydah Project back before the wreck was identified. The coins have a value of around 2 to 3 hundred dollars but because there are collectors who collect samples from ALL known wrecks, there are always people who will pay alot more to own one. I have several and have been collecting them for many years now. The only problem I see with your coin is that you have no way to prove that it is a Whydah Coin. With the coins that were presented to investors, there is a certificate of authenticity from the Whydah Project People and many times also comes with a Tyvek card printed by The Whydah Project/conservators which is proof you would need. Without this paperwork, your coin, even if it was found where you say and authentic, would be very difficult to prove. If you want further info, please leave your e-mail address on the site and I will return e-mail Hope this helps. Actually, Whydah Gally coins are ultra rare. I think what you meant to say was that coins similar to those found on the Whydah are common. Although there are many people over the past couple of hundred years who have claimed, with stars in their eyes, to have found a coin from the Whydah on the beach, coins are often found up and down the Cape Cod coast because there are more than 3,500 shipwrecks there. Only coins recovered lawfully by Barry Clifford's expeditions can ever be considered authentic Whydah artifacts. The location was not even precisely known until the research of the expedition's project historian, the late Ken Kinkor, and the 1985 discovery of the ship's bell inscribed "The Whydah Gally 1717". Whydah artifacts do not wash up on the beach - at least not for more than two hundred years - because the artifacts are solidly buried between 10 to 50 feet under the sand, under 16 to 30 feet of water, spread over a four mile area, 1,500 feet from the beach. Though Clifford on rare occasions has gifted some of his Whydah coins, he does not sell any artifacts that are recovered. Only three fully certified coins are known to have been sold by the people, or their heirs, who were gifted them by Clifford. 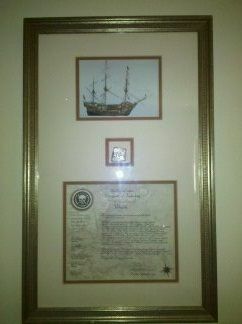 The coin that is being sold here is one of those three; it does in fact have an official certificate of authenticity, signed by Barry Clifford and former board and team members, accompanied by a portrait of the Whydah created as a commemorative poster that was offered at a temporary Whydah artifact display at the Provincetown Pilgrim Monument Museum nearly 20 years ago (these are still available at the Whydah Pirate Museum). Actually what I said in previous post is accurate. Whydah coins are not "rare", they are quite common to the period. In the mix you may find a rare date or design with them but generally they were just coins circulating at the time. Barry Clifford and crew has found tens of thousands of these coins, in denomination of 2 reales 4 reales, and 8 reales, with the 8's being most common. What the previous poster was saying was that the Whydah coin is rare to the marketplace and seldom seen for sale. The Whydah Museum in Provencetown has the bulk of them on display and the salvers does not sell them. Only the coins given away as gifts to investors sometimes find there way to market. So, rare to the marketplace but many thousands displayed in a museum.